Bedlam & the madness of George III’s would-be assassin Margaret Nicholson | What About Victoria? 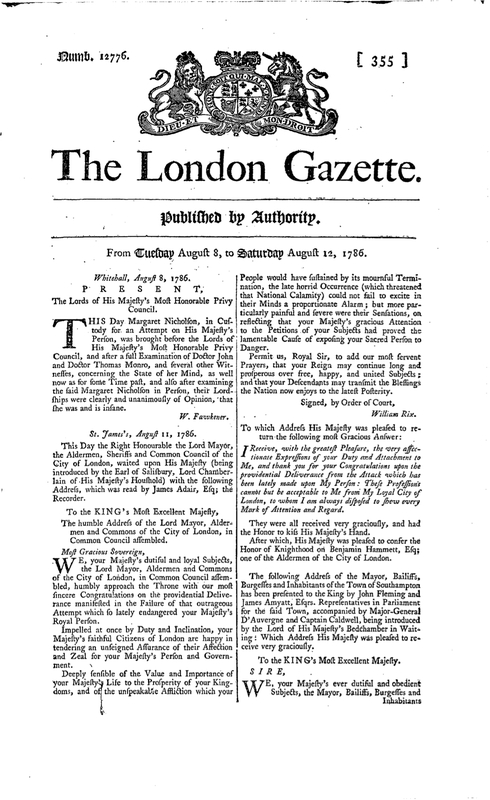 Quite well-known, the madness of King George III (1738-1820) is historically documented and was recently popularized in the 1994 film The Madness of King George. Less famous are the insane would-be assassins of George who were institutionalized at Bedlam, or the Bethlem Royal Hospital, which my class will be visiting tomorrow morning and afternoon. Particularly interesting to me is the case of Margaret Nicholson, who aimed to kill George III on August 2, 1786. Today, the Bethlem Royal Hospital is part of the UK National Health Service. From what I can tell from its website, Bethlem now functions as most modern psychiatric hospitals in the rich countries of the world. The primary purpose of the current facility, as with almost all other modern psychiatric hospitals, is acute inpatient care, which means short-term, crisis care. This contrasts greatly, of course, with the asylum Margaret Nicholson would have encountered after her skirmish with King George in 1786. The lady was deluded: she thought herself the rightful heir to the throne, and George was in the way. With a fake petition in hand, Ms. Nicholson approached the King as he was getting out of his carriage. The King took the ‘petition’, and Ms. Nicholson jabbed at him twice with a dessert knife. No harm was done, and sensing Nicholson was insane, the King urged his guards not to harm her. The event garnered much attention at the time. 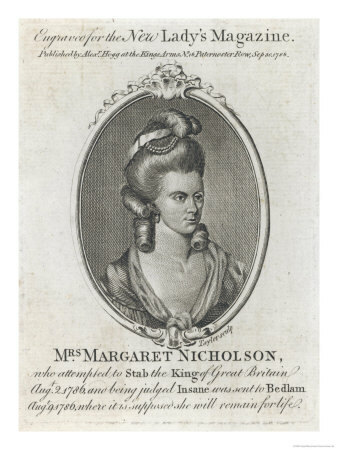 King George’s handling of the event increased his public popularity, and Margaret Nicholson was sent to Bedlam for the remainder of her days. After her death, the English poet Percy Shelley and Thomas Hogg published under a pseudonym what they claimed were ‘poems found amongst the papers of that noted female who attempted the life of the King in 1786’. They were not, but the book‘s existence demonstrates the significance of the event in public consciousness. King George III apparently perceived Margaret Nicholson’s insanity when others might have not. Some slight personal knowledge or inkling of madness might have been present even then, years before the eventual insanity of George himself.